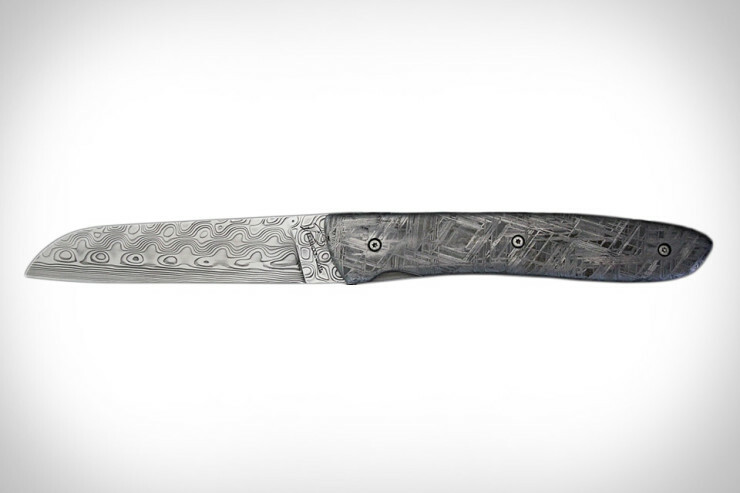 A Meteor Knife With A Damascus Steel Blade | OhGizmo! By David Ponce on 03/10/16 • Leave a comment! Damascus steel is pretty popular in knife-making these days, due to its unique appearance made by “hammer-welding strips of steel and iron followed by repeated heating and forging”. That’s how it’s done today, although the technique dates back hundreds of years and no one is really sure just how it was made back then. The point is that it’s back in fashion, and it’s fairly common to see it around. What isn’t common however is to see a knife with a Damascus Steel blade… and a meteorite handle. Perceval Meteor Knives are exactly that, with a handle carved straight out of a rock that fell from space, and a blade made right here from common elements. No two are identical, and given their relative rarity, they’re expensive as hell: one will set you back around $5,000. The knives use a type of meteorite known as Muonionalusta meteorite. They don’t do anything special, other than look pretty slick. For people with too much money, it’s a cool toy to have.